On the Celebration of the Fiftieth Anniversary of Sacred Heart Church in 1970, a testimonial dinner was held. The information that follows was documented for that event, and serves as a written history for our parish. We thank the members of that committee for taking the time and effort to create such a comprehensive document … to serve as testament to the history of Sacred Heart Church. Additions have been added in brackets  where necessary. Though records indicate that some Catholic families settled in the area of Bath as far back as the late 1700’s, it was not until 1920 that a Catholic Parish was established here. Prior to that time, Catholics who wanted to practice their religion had to journey to Easton, Catasauqua, Bethlehem, or other neighboring towns, posing a trip of some magnitude in those days. The strong influx of immigrants to this area in the decades prior to 1910 – a mixture of nationalities predominantly of the Catholic faith – focused attention on the need for a Catholic house of worship in this locality. The condition was somewhat relieved in 1908 when the Holy Family Parish in Nazareth – only 4 miles distant – was established under the pastorate of the Rev. Father Bernard Greifenberg, Missionary of the Sacred Heart. The Bath area “homeless” Catholics proved to be fertile ground for the missionary efforts of Father Greifenberg, who realized the necessity for a mission Church in Bath. Under his guidance, in 1915 Bath’s old motion picture house, which stood at the rear of the southwest corner of Northampton and Chestnut Streets, was rented and converted to Church use. Every second Sunday Holy Mass was said there for the accommodation of those in the neighborhood, comprising possibly two-dozen families in all. Two present-day parishioners – John M. Bauer and Irvin J. Metz – carry the distinction of having been the first altar boys to serve in Bath’s first makeshift Catholic Church. A large garlanded black Crucifix was painted on the off-white screen up front, and beneath stood the improvised altar. The old narrow theater benches served as pews, and a high-backed pedal organ stood up near the front on the right side, with some folding chairs around it for the small choir. The building also served as a schoolroom for “Sunday” school conducted on Saturday afternoons by the Nazareth Mission Sisters of the Sacred Heart. After a period of religious training, those of age were prepared to receive the Sacraments of Penance and Holy Communion. Many of us celebrating this fiftieth anniversary were in the groups that made their first Confession and first Holy Communion oat the Holy Family Church. What a thrilling experience it was to travel to Nazareth on the Bath-Nazareth trolley line for this great occasion. 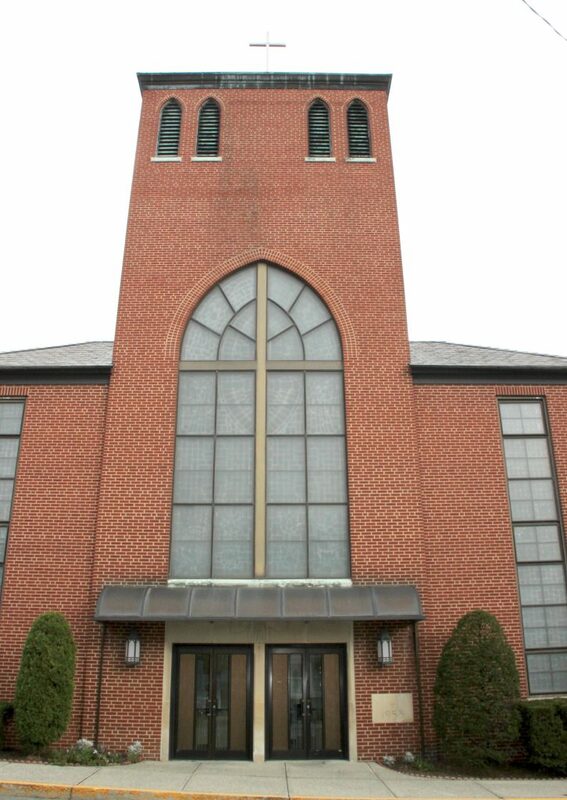 © Copyright 2019 - Sacred Heart of Jesus Parish, Bath, PA Powered by Melior.